The Corporate Card that turns your business spending into greater value. Your employees are invited to enrol in the Card Member rewards programme. Asia Miles can be redeemed for flight awards or an extensive array of lifestyle awards. American Express Selects6 offers a world of privileges with year-round access to savings and offers. Card Members can save up to 20% on dining in Hong Kong, Sydney, New York, London and other destination cities. Plus, enjoy a wide range of discounts and special offers for travel, entertainment and shopping when travelling abroad. First year waived, with yearly waiver when you reach the minimum annual spend per Card7. Professional and dedicated customer support is always just a phone call away to assist with billing enquires, replacement Card requests or access to a Card benefit or service. With enrollment, Corporate Express Cash8 allows employees access to cash for travel emergencies and incidentals at over 600,000 ATMs worldwide. For legal and medical emergencies while travelling, Card Members can call the free Global Assist9 service, which will connect them with an English or Chinese-speaking lawyer or doctor. The service is available 24 hours a day virtually anywhere in the world, whenever Card Members travel more than 200km from home, for up to 90 days. The Cathay Pacific Corporate Card guarantees protection against fraudulent transactions on your Card, provided responsible care has been taken and as long as we are notified immediately after discovery of any fraudulent transactions, in compliance with Card Terms and Conditions. American Express SafeKey11 further enhances online transaction security with added security measure to safeguard your online purchases. Manage Your Card Account is a complimentary online management tool that provides Card Members with 24/7 access to their American Express Corporate Card account. Card Members can view statements, make payments, set up email or mobile alerts, anytime, anywhere Internet access is available. Manage your entire card programme with American Express @ Work, an expandable suite of online Management Information (MI) reporting tools that allow you to execute the administration, reporting and management of spend data online. The Corporate Card programme allows you to strengthen cash flow by coordinating billing, payment and reimbursement cycles. Increase your liquidity, whilst ensuring that your vendors are paid on time. Pay suppliers through American Express and get up to 51 credit-free days12 without any added credit interest to pay your statement, allowing funds to earn interest or be used elsewhere. Card Member can enjoy greater flexibility in spending with no pre-set limit13, your purchasing power can increase over time as you use your card. No pre-set spending limit does not mean unlimited spending and charges are approved based on your payment history, credit records, spending pattern with us and your current financial resources. You can spend as spend as much as you can afford to pay back, which gives your business greater financial flexibility to cater for different business needs. Enhance cash flow control with a choice of 10 cycle cut billing dates. 1. Effective from 1 August 2016. 2. Corporate Asia Miles: Corporate Asia Miles is managed and operated by Asia Miles Ltd (AML) and participation is subject to the Corporate Asia Miles terms and conditions – Large Companies / Mid-sized Companies. The Company must authorise an administrator with a specific email address to access the Corporate Asia Miles account and redeem awards on the Company’s behalf. The Company must provide a copy of the authorised email address to American Express. Asia Miles enrolment is automatic on approval of your American Express Cathay Pacific Corporate Card account. The Company will earn Asia Miles on all Cathay Pacific and Cathay Dragon tickets and infight transactions purchased on the American Express Cathay Pacific Corporate Card. 3. Card Members Rewards: An annual Card Member rewards programme fee applies. Enrolment is not automatic and subject to Company approval. Asia Miles is managed and operated by Asia Miles Ltd (AML) and participation in Asia Miles is subject to the Asia Miles terms and conditions set out at www.asiamiles.com. You must be an Asia Miles member to earn and redeem Asia Miles. Your employer must confirm your eligibility to enrol in the Card Member rewards programme where you’ll earn Asia Miles for spending on your Corporate Card. An annual fee currently HK$400 applies and is only open to individuals. Asia Miles will be transferred each month to your Asia Miles account - please refer to your monthly Card statement for a summary of Asia Miles earned and transferred. For all Asia Miles balance enquiries or to redeem Asia Miles, visit www.asiamiles.com. The following types of charges are not eligible for Asia Miles: charges processed and billed prior to the enrolment date, cash advance and other cash services, Corporate Cash, American Express Travellers Cheque purchases, American Express Gift Cheque or Travel Gift Certificate purchases, charges for dishonoured cheques, finance charges, late payment and referral charges, tax refunds from overseas purchases, annual membership fee, express cash handling fee, fees relating to foreign currency transactions, tax bill payment, and for any utility, gas and electricity payment on Card Members' Card Accounts. 4. Bonus Asia Miles applies only to qualified Companies under specific market segments. 5. Corporate Card Members enrolled in the Card Member rewards programme will receive a spend bonus of 1,500 Asia Miles if their spend on the American Express Cathay Pacific Corporate Card accumulates HK$200,000 or more during the 12 months ending on the Card Member rewards programme anniversary date. Elite Corporate Card Members enrolled in the Card Member rewards programme will receive a spend bonus of 3,000 Asia Miles if their spend on the American Express Cathay Pacific Elite Corporate Card accumulates HK$400,000 or more during the 12 months ending on the Card Member rewards programme anniversary date. 6. American Express Selects: Terms and Conditions apply. 7. Annual Card Fee: American Express will waive the first year annual Card fee. 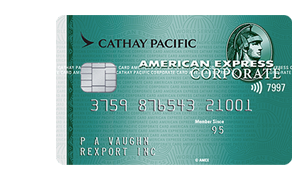 The American Express Cathay Pacific Corporate Card annual fee is currently HK$440 per annum. American Express will waive the next annual fee if your spend in the previous year is HK$200,000 or more per Card on the Corporate Card. 8. Corporate Cash: Requires Company participation and Card Member enrolment. Subject to terms and conditions. 9. Global Assist Hotline: You must arrange all medical and visitor transportation. As the Global Assist Hotline is an assistance service, we cannot reimburse you for expenses you incur on your own. Please refer to the Global Assist Summary of Coverage for additional details and restrictions. 10. Business Travel Insurance: The plan is underwritten by Chubb Insurance Hong Kong Limited, American Express International, Inc. does not act as an agent or fiduciary for you, and American Express International, Inc. may act on behalf of the insurance provider, as permitted by law. Exclusions and limitations apply. Please refer to your Travel Protector plan for details. 11. SafeKey®: Secure online shopping with American Express SafeKey. Click here to learn more. 12. 51 credit-free days: Actual credit-free period will vary based on the date of charge and the billing cycle cut-off date. 13. Subject to American Express’s risk management policies.